The holiday season really is the most wonderful time of the year. From festive home décor to holiday parties to quality time spent with your favorite people, there’s a whole lot to love about this season. And during the holidays, entertaining for our nearest and dearest is at the very top of that list. 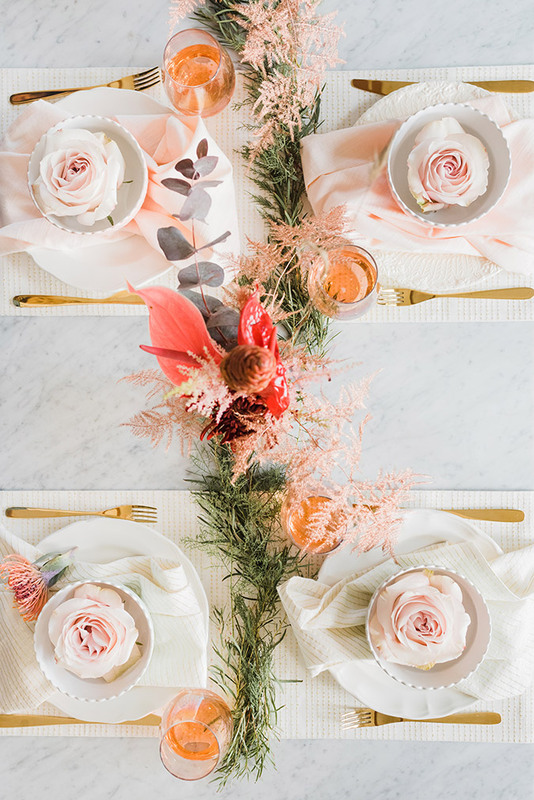 Lucky for us, Lauren designed the most beautiful line of tabletop items for her LC Lauren Conrad collection at Kohl’s, just in time for your next holiday party! 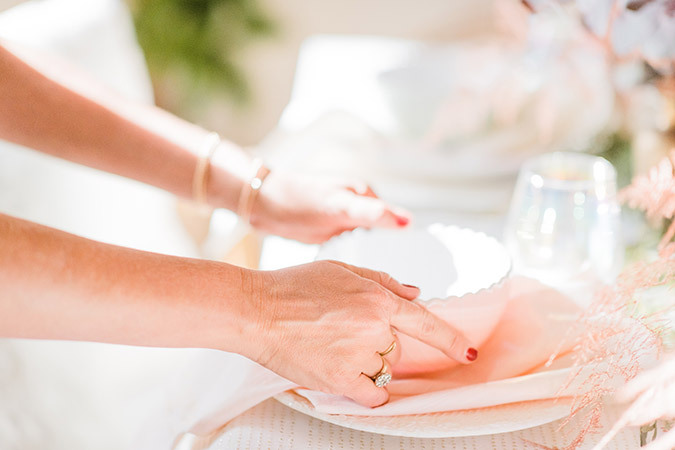 So to give you all of the entertaining inspiration you can handle, we enlisted prop stylist extraordinaire Kate Martindale to create a little soiree for us, using her favorite pieces from the new line. The end result was beyond beautiful, and we are so excited to share it with you today. 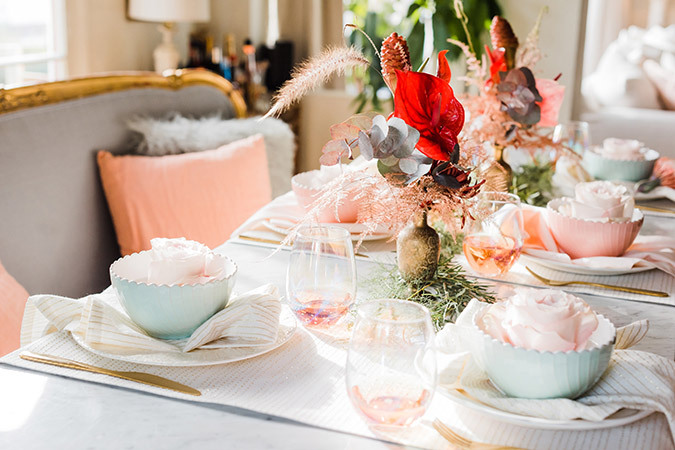 Kate built the pastel-inspired tablescape around the pale pink and mint green bowls from the LC Lauren Conrad line, as well as the iridescent stemless wine glasses (which are hands-down our favorite piece). 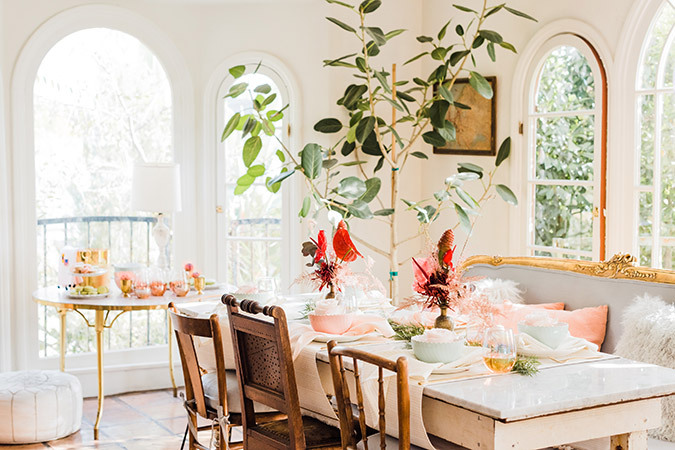 Every detail was picture perfect, and will hopefully give you a lot of unique ideas for your next holiday dinner party. First, Kate started with the florals, which she picked up at the L.A. Flower Market earlier that morning. 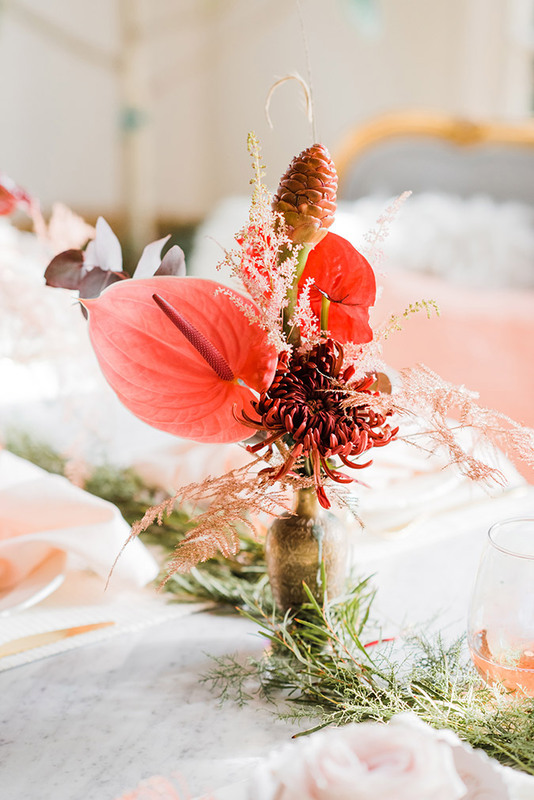 She mixed red and pink flowers, which she arranged in vintage brass vases, for a festive yet eclectic and vintage look. 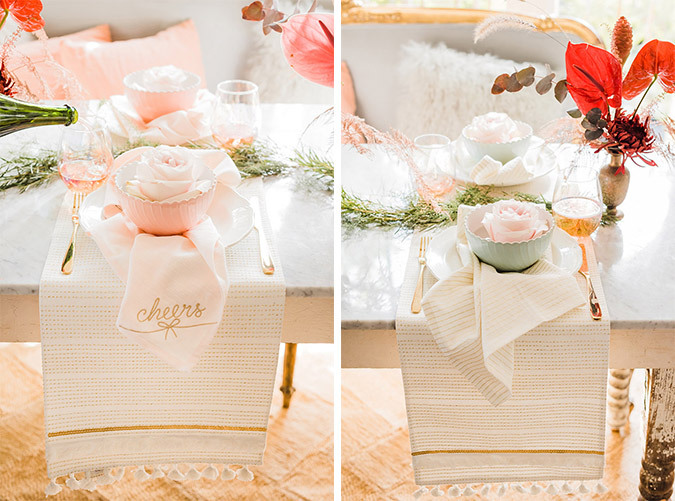 Then, Kate laid down three LC Lauren Conrad Tassel Table Runners horizontally across the table, instead of length-wise down the middle, which is a fun twist. She then lined the center of the table with different kinds of greenery that she also picked up at the flower market. 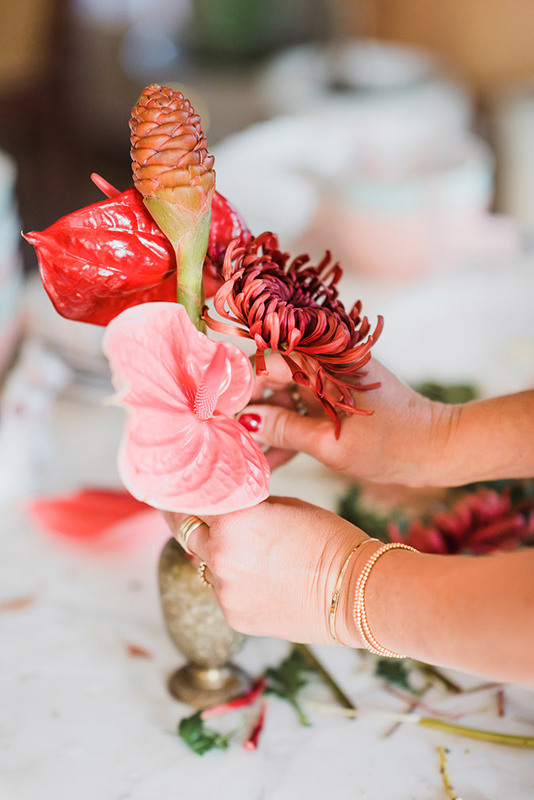 If you ask us, greenery is a must when you’re building out a tablescape. 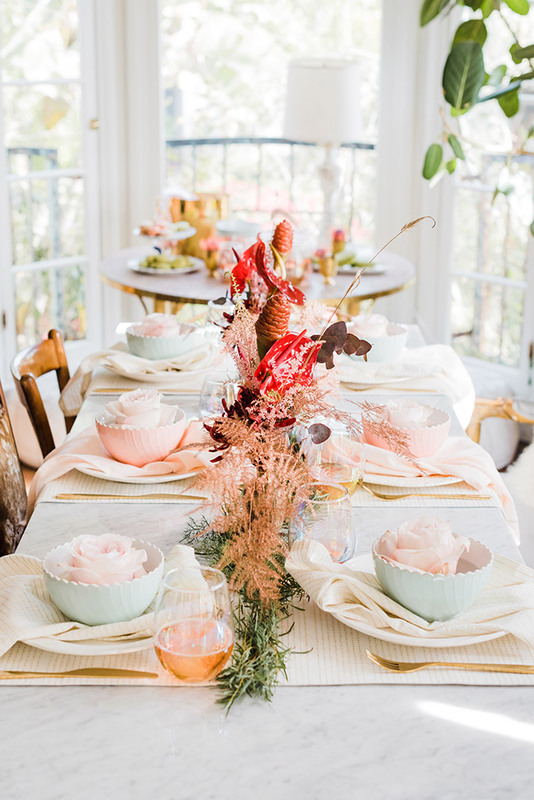 Next, Kate layered LC Lauren Conrad Cheers & Yum Napkins on top of plain white plates, and topped the napkins with LC Lauren Conrad Bowls, which come in mint green and pale pink. 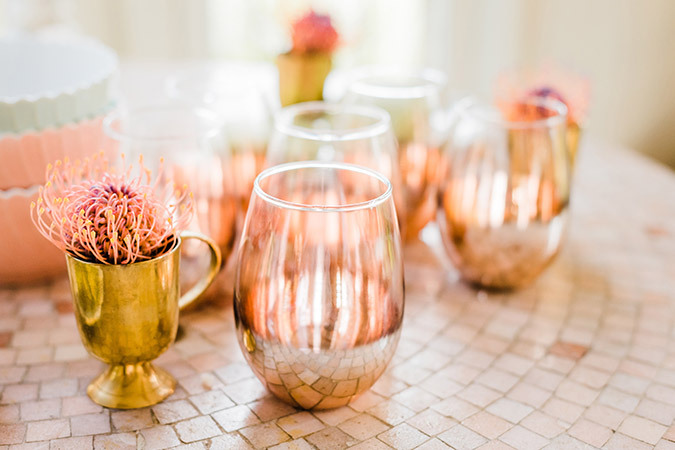 Each place setting was finished off with an LC Lauren Conrad Iridescent Stemless Wine Glass, and brass flatware. 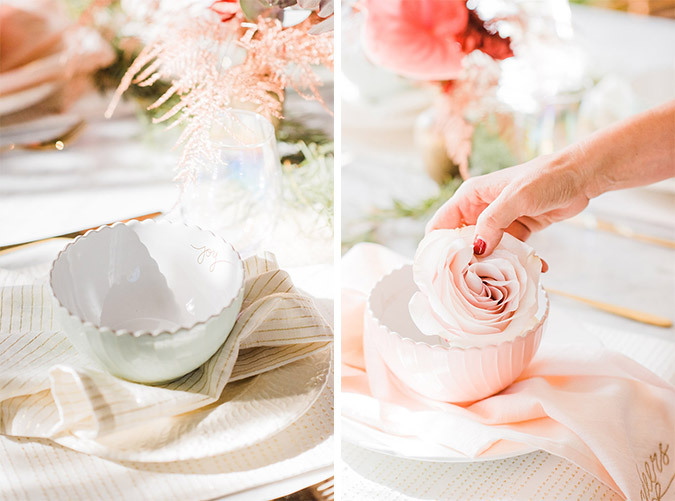 The bright blooms popped against the pastel dishes and neutral linens. 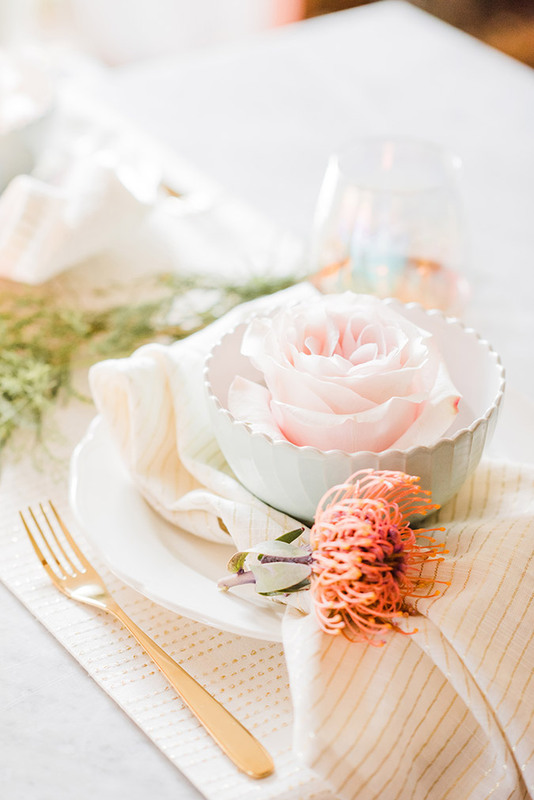 Kate found these gorgeous garden roses at the flower market, and she decided to use them to decorate the tablescape… by placing them inside of each bowl! She simply filled the bowls halfway with water, cut off the stems, and placed the top of the rose in. 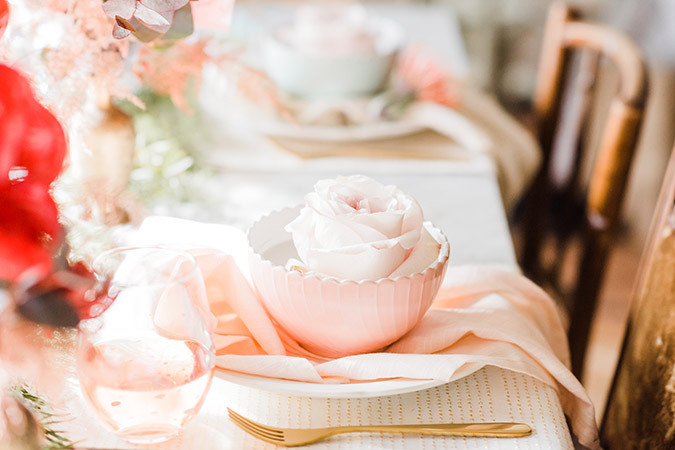 Entertaining Hack: When you place a flower in a soup bowl for a place setting, if you are planning on serving soup, you can put warm water in the bowls instead of cold. The warm water will allow the flower to open up some, and also warm your bowl for when you are ready to serve soup. 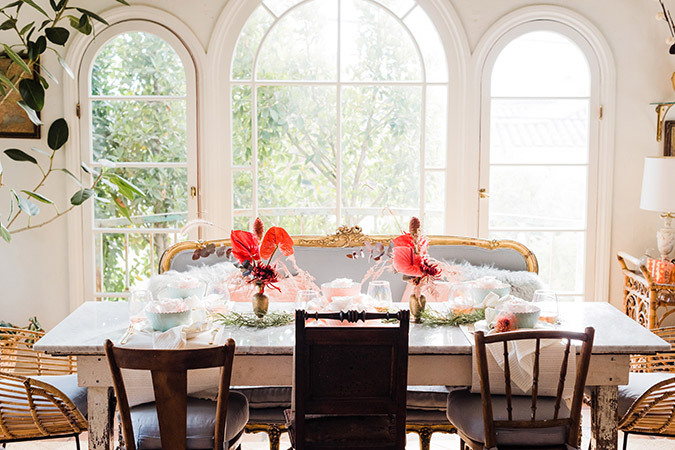 The result was a tablescape that is equal parts whimsical and classic. It was truly one of the most beautiful setups we’d ever seen! And it doesn’t hurt that Kate’s home is styled to perfection, either. 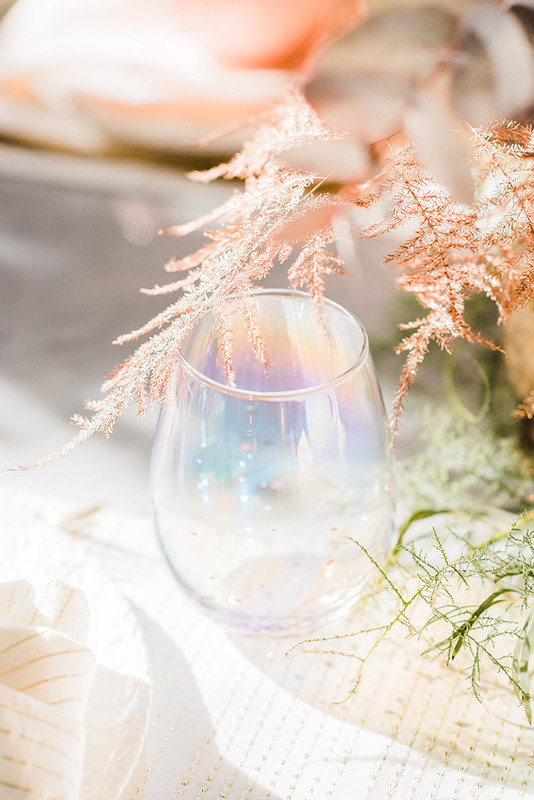 These gorgeous LC Lauren Conrad Iridescent Wine Glasses are going to sell fast… order yours from Kohl’s ASAP! 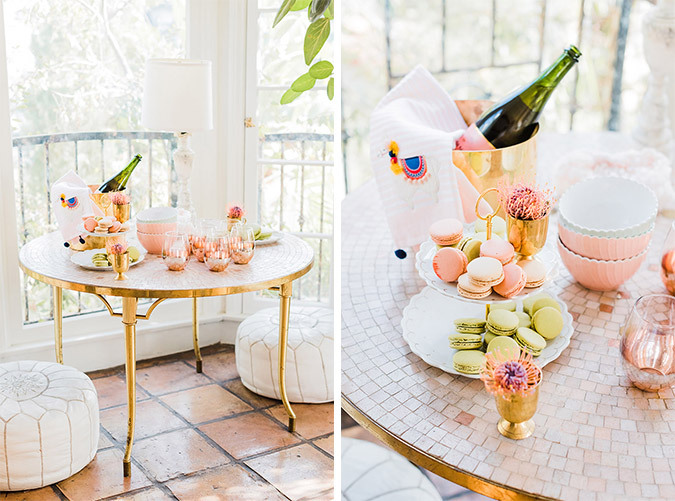 Kate also set up this adorable dessert station, where she made rosé pistachio ice cream floats and served up the most delicious macaron-topped ice cream. 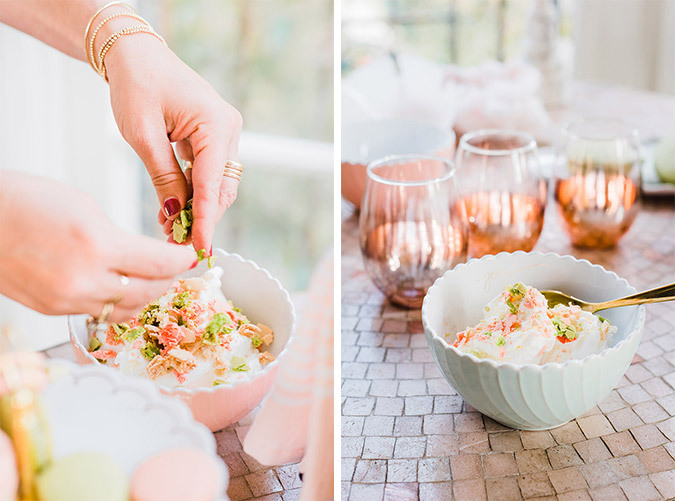 Just add a scoop of pistachio ice cream and top it off with rosé champagne for a dessert cocktail that is guaranteed to please your guests. P.S. 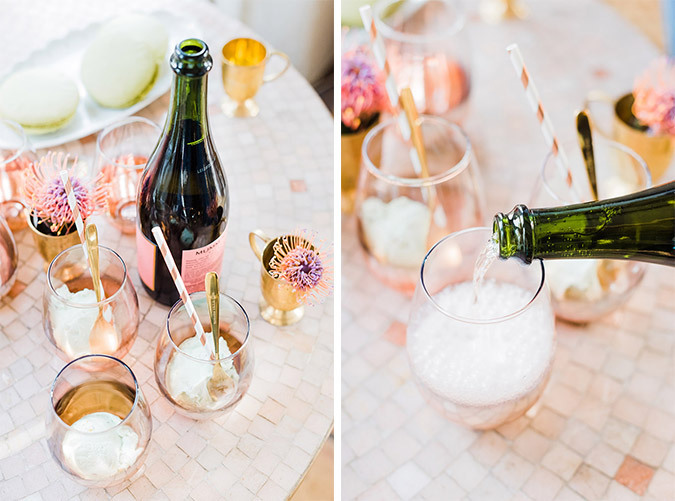 Make sure your champagne is really cold by already having it chilled. Or, to really make the float yummy, place the bottle in the freezer 30 minutes prior to serving. 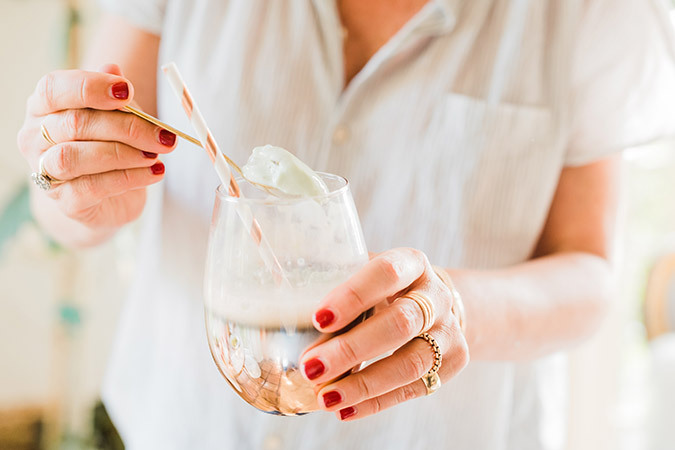 Boozy ice cream float, anyone? Kate then offered up bowls of ice cream topped with crumbled macarons, and it was equal parts pretty and delicious. All in all, it was an incredibly beautiful afternoon, and got us very excited to entertain this holiday season. 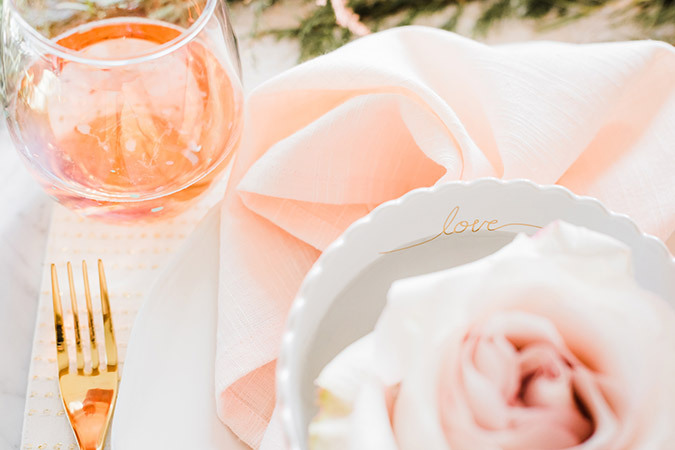 Shop the LC Lauren Conrad Tabletop Collection at Kohl’s, and make sure you’re following @KateProp on Instagram for all of the entertaining and interior design inspiration. 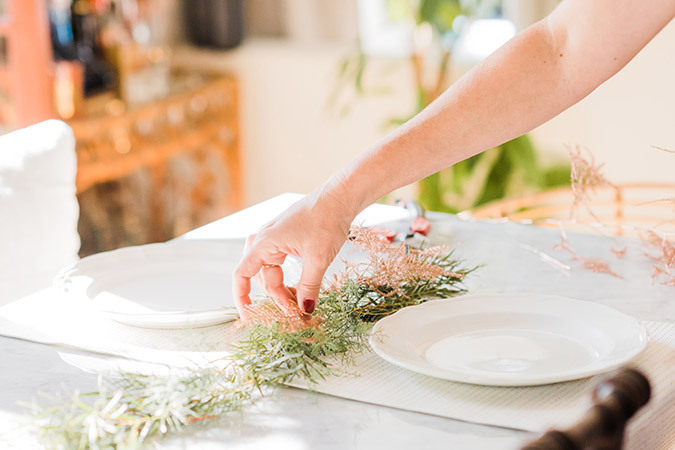 What are your go-to entertaining tips and tricks when it comes to the holidays?